Last month, we introduced our second Make it Month contest with our March sample of the month which conveniently happened to be one of my favorites fragrances, Oatmeal Milk & Honey Cybilla. The entries came pouring in and I got to see some really unique and fun designs and products. If you missed the contest, you can check out all the entries in our album on Bramble Berry’s Facebook page. Are you ready for the winners? A big thank you to all the participants in the contest, Team Bramble Berry loved seeing your soaps. If you happen to have a full tutorial that goes with your photo, we’d love to see it and give you a chance to win a $10 Bramble Berry Gift Certificate. For full details on this ongoing Teach Soap contest, click here. 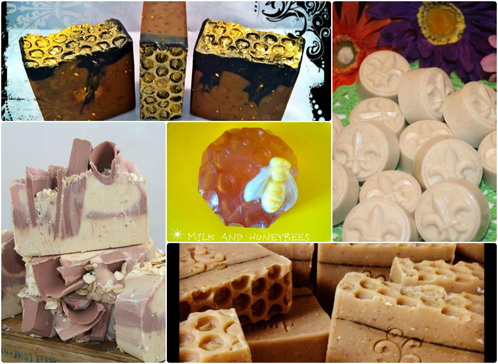 I love the Oatmeal Milk & Honey Soap with the Gold Mica on top. The usage of Bubble Wrap to make the soap look like a honey comb is brillant. I’m definitely going to give this idea a try. Everyone did an amazing job! I’m totally with you, Joanne! I love using the bubble wrap for honeycomb soap, it’s just such a creative idea. Have you checked this recipe yet? It’s a M&P with the same technique and it just turned out so well. Keep us updated on how yours turns out and if you get any pictures, we’d love to see it! You can share them with us on Bramble Berry’s Facebook page. Thanks for participating in our contest, Amanda! We really had so much fun seeing all the fun entries and the creativity that all these fabulous soapmakers brought to it. Thank you so much for choosing my soap! I love all of your products and appreciate all the encouragement your company does. I’m honored! Yay!! Thank you for choosing my soap!! !